The following are updates & outlooks on the market, beginning with the most recent. Some people may ask why a small-town real estate broker knows this stuff, so I'd answer that writing market commentaries and investment-education articles was my full-time job for about 10 years (including being the Senior Writer/Managing Editor of the largest financial newsletter on the planet at the time: Merrill Lynch's Insights & Strategies). The market is hot again and prices are UP (though still not at the 2007 boom time prices - which is most likely a good thing). Pretty much everyone knows the market is in very good shape at this point. We've been so busy, updating things like this (and the "fun" parts of our HUGE Website) has been a challenge. I am actually hoping the market slows down in terms of price appreciation and simply continues slow growth through 2020. I like a slow, steady increase, and we've had plenty of fairly large gains the past few years. Vacant land has significantly lagged homes (as it typically does during a recovery), so we see the greatest price appreciation potential during the next couple years in lots and land. I am thinking building lots could easily triple or even quadruple in price the next few years (they are still pretty low) and nicer acreage and waterfornt land could double from today's prices. Finding homes to fix up and flip has been a challenge for investors. It is getting to the point where prices are making it an easier choice to build instead of remodel - which is nice as there has not been a lot of new homes built since 2006. Well, the 2016-2017 Snowbird season is almost over and it was - and still is - BLISTERING! We are busier than even possibly at the height of the boom (though prices are well lower). It is a fact: The best time to buy is long gone. Prices are up about 30% on comparable homes selling now compared to the best deals during the bust (typically foreclosures). The recently built homes have gained even more and there are far fewer available (sorry to those who waited too long - you REALLY missed a golden opportunity). That all said, it's still pretty good for buyers. Most people find it smarter and cheaper to buy existing homes than to build, but we are seeing some building now as it sort of "evens out" (it may be more for a new home, but it would be new so some people want to build). The great deals are far fewer and it's much more of challenge to find them and there are typically multiple offers on the very best deals. Early last year we listed a foreclosure built in 2006 - which needed quite a bit of cleaning and some work - for 84k and we had 4 offers the first week and it went over full price. It is already worth a LOT more than that and pretty much impossible to find that type of deal. The thing now is to find a solid deal and simply be happy. This, of course, is good news for sellers as even though the high prices of the boom are nowhere in sight, their homes are worth much more than at the bottom of the market and if priced right, most homes sell quickly. It is obvious to anyone looking (especially those who waited to buy for a few years thinking it would get lower and lower) that we are well off the market lows. Buyers will pay more and sellers are more emboldened. I am seeing some pretty high listing prices now, so I hope sellers don't start thinking it's 2006 again and try to go up too quickly. This has been and should be a slow, steady recovery! There are still a few foreclosures being listed, but the trend of less and less continues and the remainders have sat quite a long time so care is needed: It may take quite a bit of money to "bring them back" so don't simply be fooled by "price tag" - you may be better off paying a little more for a well-cared for home! We have been very busy since ealry 2014. We added several good, full-time agents this past summer and fall which was quite a surprise for "the off season." I think it's still a case of "pent up buying" where those who were waiting and waiting, thinking prices would go down forever (like those at the peak who thought they would go up forever), realized they waited too long when they saw the prices rising so are now pulling the trigger. There are still plenty of good deals, but the best time for buyers of pretty much any type of home in our area looks to be past. Now, it's time to find a solid deal and be happy with a great home - nothing wrong with that!  I know it has been a while since the last update - sorry, I've been pretty busy! The 2012-2013 Snowbird Season was solid for sales - not manic, but okay. However, after the "official" season ended, things did not slow down as we thought - actually it was quite the contrary and we have been busier! I think there was (and is) a lot of pent-up buying. People who had been watching the market for months and months suddenly saw homes going under contract more quickly and that had a snowball effect and we found ourselves dealing with multiple offers, the best deals going in days, etc. It felt like 2006 again (without the high prices, that is). Though it still has not slowed down (which is VERY unusual for this time of year), I do think it will slow somewhat as we ease out of summer and into early fall, but then we typically see things picking up again as the people up north get their first few cold nights! The one area in the market which proved to provide the best deals the past few years has certainly passed (in terms of a "golden age" for buyers). 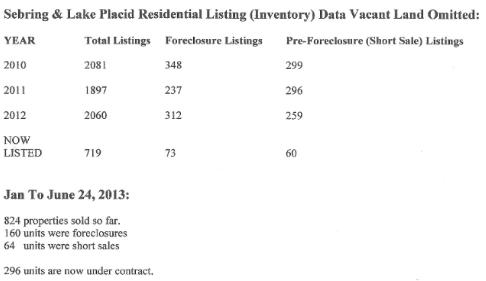 Right now - end of June, 2013 - there are 12 foreclosure homes built in 2000 and newer for sale in all of Sebring & Lake Placid. We had about 300 for sale a few years ago, a couple hundred a couple years ago and over 100 at the beginning of the last Snowbird Season. Of course, there will be more listed, but nowhere near the numbers in the past. The vast majority were vacant investor-built "spec" homes and they have long since walked away (very few were "end users" losing their jobs, etc. in our area). The "remainders" are mostly homes held up in court for one reason or another - there are quite a few of these, but many are not so good (and have been sitting for a LONG time so be prepared to spend money on these homes "bringing them back." Right now, there are 13 short sales (pre foreclosures) listed in all of Sebring & Lake Placid built in 2000 and newer - there were always well over a hundred and many times over 200 whenever I checked any time during 2010-2012 - a HUGE difference (and a method to "see the future" of the foreclosure listings). Where we are seeing the best deals now are in the condos and older but nicer, updated single-family homes (typically built in the 80s-90s). There were around 300 foreclosures built in 2004 and newer before the snowbirds started gobbling them up during the winter/spring 2010 season, and less each season thereafter. We told people about this trend and some "got it" and some did not. Many of our buyers were lucky enough to find one of these relatively new foreclosure homes at a great price, and a home still in GREAT condition (basically almost like new), but many also keep waiting thinking prices will come down forever. But they are basing that on "feelings" - not on data. The trouble is, no matter what “they” (TV, radio, etc.) say, there aren't as many (good ones) left, and there won’t be an unlimited supply and they keep sitting and sitting (empty!) - not good for a home! Real estate is local so buyers have to “work” the local market. Very few people in our area are losing jobs, as we are primarily an area of senior citizens and snowbirds. The vast majority of our foreclosures were “spec homes” built by investors and virtually all of these investors have long since walked away. We are tracking the short sales and new listings and can "guesstimate" there will be more good foreclosures, but nowhere near what we had. If you’re looking for an older foreclosure, there are good deals, but even these are thinning out. Again, most of these homes were purchased by investors to flip but they held on too long or were stubborn and didn’t reduce when they should have, so they got stuck and eventually walked away. Many homes for sale now are owned by seniors and they are retired, have money, etc. Of course, many of these people do want to sell, but they are not in complete financial distress. This can be good and bad - good because you want to live in a stable area (not one that has a bunch of new homes which are turning into low-income rental areas) and bad because there are not as many good foreclosures to choose from. If you are a buyer looking for a newer home at a great price, you need to get serious - you really are missing a golden opportunity. Well, the July 4 holiday weekend is now upon us and we’re (somewhat) scratching our heads. This down market may last quite a bit longer than we thought (I blame the banks!). Not a lot of sales and it hurts for sure! After a good first quarter with snowbirds keeping us busier than we figured, it has slowed down quite a bit. We believe it's due to the South Florida folks simply renting or not making moves yet (the economy was hit harder down there than most places, and with uncertainty, people put off what they may LIKE to buy but don't NEED to buy). That could actually bode well for the future for waterfront reductions, as, hopefully, some of these sellers will "come to their senses" and realize their prices are way too high. So, the best news for snowbird buyers is: With the summer slowdown, waterfront may become more affordable for them. We hope everyone has/(& had by the time many read this) a GREAT holiday - we're going to do the "local thing" this year … we actually have a great fireworks display over Lake June every year – very high quality for a small town! June, 2010: A Game Changer? The Treasury has new rules beginning April 5 for short sales. By far, the most important thing is a supposed 10-day turnaround on offers. This is huge as we’ve had so many offers on short sales come and go because the banks would take from 6-18 months (yes, 18!) to respond to offers. We'd usually hear nothing and the homes would slip into foreclosure. By The Numbers - a look at the local market using MLS figures. There are essentially two markets right now: Most of the homes are overpriced and sit and sit with no one wanting to see them – we’ll call that Market #1. Market #2 then, are the best of the best homes (not by any type, but the best priced for all types). These move quickly. But, there are far less homes in Market #2 than market #1, so yes, prices on most homes have to come down. What we’ve also seen is, buyers sometimes have to wait for Market #1 homes to reduce their price. Or, they have to wait for new foreclosure listings. The question on everyone’s mind seems to be: When will the low point of the market come? Or, has it come? It’s tough to answer. But, I am as certain as I can be that there will be no one opportune time to buy – the best deals will and have been spread out. We’ve been saying this for months and we can see that pattern occurring again and again and we have been correct so far – the MLS data simply does not lie. There’s a great deal one week on a particular type of home in an area, then nothing beats it for quite some time (I’m still waiting to see some of the waterfront deals from several months ago be “topped”). One big change is we’ll “run out” of the investor-built, new construction foreclosures. Buyers have to understand – this area is different than a lot of others. There aren’t a lot of people losing their jobs which has caused the bulk of the foreclosures. Most all our foreclosures are homes built by or bought and remodeled by investors who got into the boom time flipping game late and got caught. This is a community of seniors, weekenders, etc – most people bring their money in. So, the few hundred nice homes built in 2005 and later are gone. I have been tracking the short sales and there will be more foreclosures, but nowhere near as many. From a purely “money” point of view, I wish there were a couple hundred more – these were the easiest sales for us for 2009! But, I also know that we need these to cycle through before this market becomes more balanced, so, for the private sellers out there, this is very good news. Second & Third Quarter, 2007 Outlook: “It's A DECENT Time To Buy - At Least A Couple Listings ...” Actually, we see more of the same (from the first quarter) and it's getting better for buyers but it should keep getting even better for quite some time. Prices have been reduced to 2005 levels and we can FINALLY say that it’s a GOOD time to buy the (very few) listings that have been REALLY reduced. The trouble? Most sellers refuse to see the truth (and you need to avoid those homes – and the agents pushing them). At least a few more homes are priced well now. And these homes are selling at this point. Smart buyers know it’s their chance to get in cheaper than they have in the past few years and they also know this low end of the market won’t last forever. Of course, some sellers are waiting out this low end of the market cycle, but many simply can't afford to wait (investors who bought too many homes, people who bought new homes before they sold, etc.) and they are in trouble now and buyers can get good deals at least on these. Fourth Quarter, 2006 Outlook: Not Great For Buyers Or Sellers! This economy (and what you should do) can be very confusing. I simply look at "the numbers," and utilize common sense to come up with at least a few answers. I think we absolutely need a big correction in the housing market. The run up was too much too fast. It has and will continue to be a buyer’s market throughout the end of 2006 and 2007 (though this isn't exactly true as virtually all sellers are pricing like it's a seller's market!). It should slowly return to a more normal market some time in 2008. It won’t be “flying high,” for quite some time, but simply a more balanced market with perhaps a bit of appreciation in a few areas and prices simply stabilizing in others. At some point, we'll have a bit of a run up again, but the timing of this is very uncertain. My guess has been about 6 years - 2011 or 2012. In our area specifically, I think we've seen our bubble slowly deflating for quite some time now (as many areas have been and some are just now experiencing). However, there are still far too many homes listed at "boom" pricing and they just sit and sit and create a glut of inventory. Newer (and starving) Realtors keep taking these listings in desperation to get something going. We won't touch them as it's just a waste of everyone's time, but we have the luxury of doing this for now! Additionally, in one of our offices, we only work with buyers so we only deal with other brokers' listings (we simply try to find the best properties at the best price for our buyer clients). These over-priced homes continue the uncertainty and make buyers hesitant. They think prices are too high and will fall more, even though comps are available at much better prices (and are slowly selling). I think retirement will affect the housing market and eventually make it better in all three of the areas we service. We're set to get MANY people who are being "pushed" out of South Florida. I hear again and again that people want to leave as soon as they retire (or before if they can). It has just gotten way too crowded for a lot of people and we have room to grow (even with a few decades of growth). As far as people coming from up north, I don't think we'll get as much in terms of percentages of retirees moving down to our area full time (but we may). However, in sheer numbers we'll get many more people thanks to the aging boomers! Lots of people on the Upper East Coast and in the Midwest will eventually sell larger, more expensive homes for smaller homes there and seasonal homes here - that seems to be a trend that keeps occurring in greater numbers. What will stop this? The only thing I can think of is scares from hurricanes. It's just gotten so absurdly ridiculous with the media acting like we're going to get slammed every season, but I really don't think that is even somewhat probable. We went through a bad luck period and that's it. Just today as I sit and write this, the news is saying that El nino is back in the Pacific and will be next year and that's why there isn't much hurricane activity and probably won't be. Wait a minute. Why didn't they predict any of this activity last year, last month, last week? They said we'd have a record or near record hurricane year. They just can't seem to predict anything - until it's here or past. Plus, our two Central Florida locations still offer crystal-clear lakes (good for boating, swimming and fishing) and great weather and we're away from the brunt of the storms anyway. So, I just see great things ahead! Sarasota could have some problems, but the prices are out of this world and it isn't a big leap to think prices could fall 30%. I know homeowners there would gasp at this, but it would also be a good thing for many other people. So, all-in-all, I have a VERY positive outlook for our area long term. 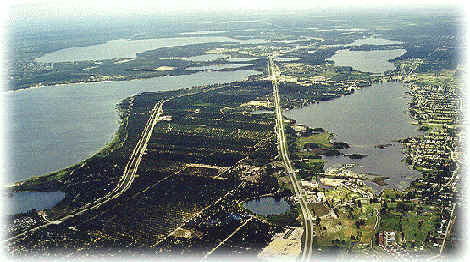 We have infrastructure, a nice area, the best lakes in the state, room to grow and room for price appreciation. They are building big, beautiful homes and people are living in them (they are not being bought by investors). I can't think of a better area in Florida set for nice, controlled growth than Highlands County - we could be in a lot of places, but that's why we're here! I think retirement will affect the housing market and make it better in all three of the areas we service. We're set to get MANY people who are being "pushed" out of South Florida. I hear again and again that people want to leave as soon as they retire (or before if they can). It has just gotten way too crowded for a lot of people and we have room to grow (even with a few decades of growth). As far as people coming from up north, I don't think we'll get as much in terms of percentages of retirees moving down to our area full time (but we may). However, in sheer numbers we'll get many more people thanks to the aging boomers! Lots of people on the Upper East Coast and in the Midwest will sell larger, more expensive homes for smaller homes there and seasonal homes here - that seems to be a trend that keeps occurring in greater numbers. What will stop this? The only thing I can think of is scares from hurricanes. It's just gotten so absurdly ridiculous with the media acting like we're going to get slammed every season, but I really don't think that is even somewhat probable. We went through a bad luck period and that's it. Just today as I sit and write this, the news is saying that El nino is back in the Pacific and will be next year and that's why there isn't much hurricane activity and probably won't be. Wait a minute. Why didn't they predict any of this activity last year, last month, last week? They said we'd have a record or near record hurricane year. They just can't seem to predict anything - until it's here or past. Plus, our two Central Florida locations still offer crystal-clear lakes (good for boating, swimming and fishing) and great weather and we're away from the brunt of the storms anyway. So, I just see great things ahead! Sarasota could have some problems, but the prices are out of this world and it isn't a big leap to think prices could fall 30%. I know homeowners there would gasp at this, but it would also be a good thing for many other people. So, all-in-all, I have a VERY positive outlook for our area. We have infrastructure, a nice area, the best lakes in the state, room to grow and room for price appreciation. They are building big, beautiful homes and people are living in them (they are not being bought by investors). I can't think of a better area in Florida set for nice, controlled growth than Highlands County - we could be in a lot of places, but that's why we're here!